In our InfoAve Premium newsletter, issue #727, in our Site of the Week section, we featured, “Be a Power Searcher with Google’s Free Online Courses”. We did a feature on Google’s power searching courses because we know how important it is to be able to find what we are looking for as quickly as possible. But time is not the only consideration, accuracy is just as important. Finding what we are looking for accurately and quickly does not happen by chance. It happens because we type in the most succinct and accurate search terms every time. If we don’t then we waste time – and so do you. But we also know many people, including ourselves (sometimes) can be adverse to taking courses to learn new things. Many people (including us… sometimes) think they already know the best way to do things. But, most of us, if we are honest with ourselves, will admit there is a lot we don’t know. And when it comes to searching, there’s a whole lot we don’t know. For instance, did you know that you can use the color of a book cover to help you find a book? You can and it’s really a cool way to search. We were not aware of that yesterday, but today we’re a bit smarter. How many of you knew you could search for things by color? It’s covered in the Power Searching with Google courses offered free of charge from this page. We know that a lot of people don’t want to spend time taking courses, but we are pretty sure if you take this course, you’ll end up saving ten times the time it took you to finish the course. No guarantees though, right EB? We’ve gleaned one of the lessons from the course and posted it below, all due respects to Google’s intellectual rights and so forth. But we thought this would encourage you to visit this page and start the Power Searching with Google course. Here are just some of the many helpful things you’ll learn. If you complete the entire course, you’ll be a power searcher! …In the last lesson, engineer Matt Cutts talked about how search works. Now you should be thinking: How can I apply that knowledge to choose better words to use in your query? Sometimes you have to try a couple of different queries to focus in on the information you want, trying different combinations of keywords. Keywords are the most important words in your idea or question—they tell the search engine what you are seeking. They can also be called search terms. When you get ready to type in a query, think for a moment about what you really want to find. One way to do that is to consider what words you think will appear on the page that would have the perfect answer. Imagine that page for a moment. How would someone else write about it? That is actually an important skill: how do you put yourself in the mindset of the author who wrote your perfect page? Think about what you are trying to find. Chose the words that you think will appear on the page. Put yourself in the mindset of the author of those words–what words would he or she use? For example, if you search Google for information about your kid who broke an arm, what kind of results would you get for a query like [busted arm]? 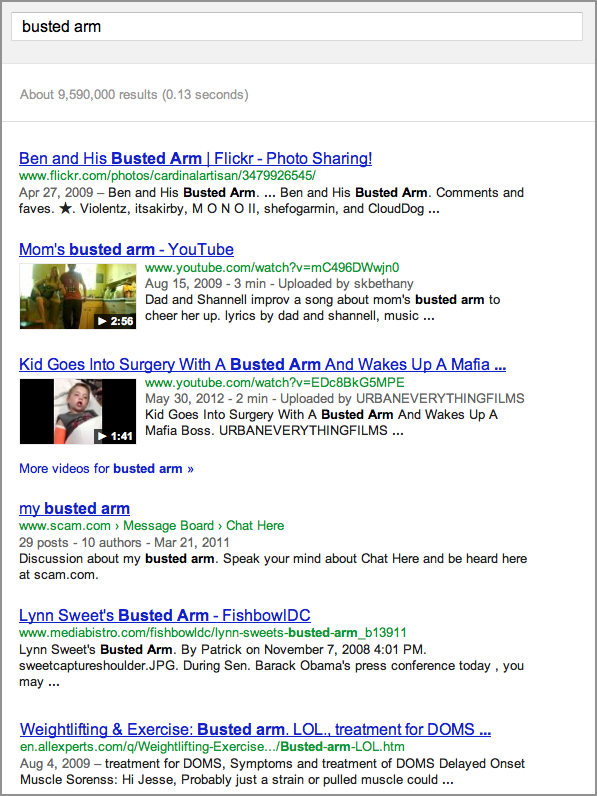 Figure: Search results for the query: [busted arm]. This might not be what you want. If you are looking for medical information on broken arms, these results may not be what you really want. What you might want to do instead is replace that query with a more appropriate word choice. Like, say, even something as simple as [broken arm]. 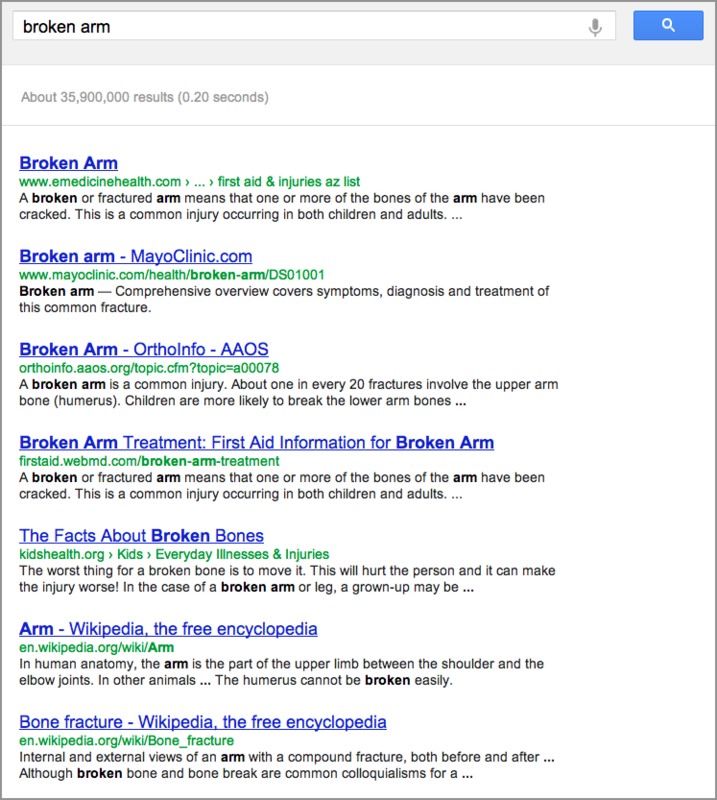 Figure: Search results for the query [broken arm]. You could also use [bone fracture] or some other medically appropriate term. The big idea here is that the words you choose will influence the kinds of results you get. We once saw a sixth grade student who was trying to find information on Costa Rica jungle ecosystems using the query [sweaty clothes]. He identified [sweaty clothes] with the state he would be in if he was experiencing the jungle, but most pages that used that phrase were about other topics. So, for example, if someone says to you, “I heard there was some old city in San Francisco Bay. What was it called?” it is best to consider what words will actually appear on the page with your answer. This query uses a lot of words to describe a very simple concept. Those extra words that are outside the central idea of the query end up bringing up all kinds of results that may or may not be relevant to your question. So what you’re doing, in essence, is getting off topic. 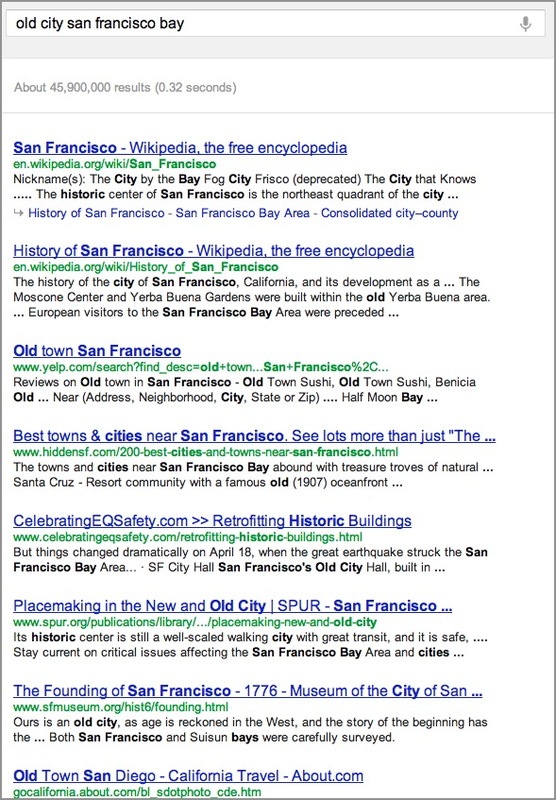 The first result is from Wikipedia, for San Francisco. That’s the most common two word phrase in that query. So the idea of San Francisco naturally comes to the top. San Francisco Bay is another common phrase. 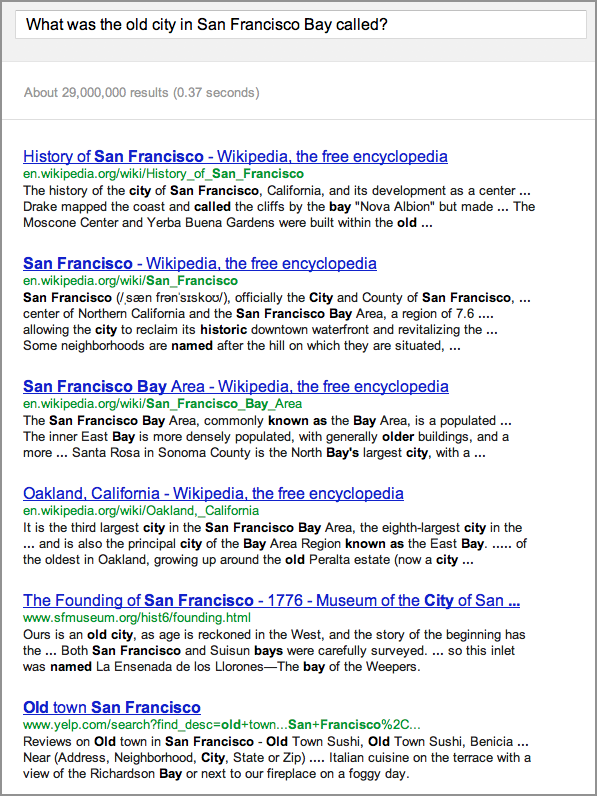 History of San Francisco also comes up because we use the word old and the word city. Comparing the results to the words in the query, you can see that the words in the query really are what is defining those results. Here we have gotten rid of the extra words, like was, the, and in. These words matter in English, but they do not define the topic for which you are searching. Still, the results are not much better. You can see that the first three results here appear in the top four results in the previous search. These results reflect the query well, but do not give you the information you seek. Figure: Results for [ghost town San Francisco Bay]. This query has some results that are exactly on target. 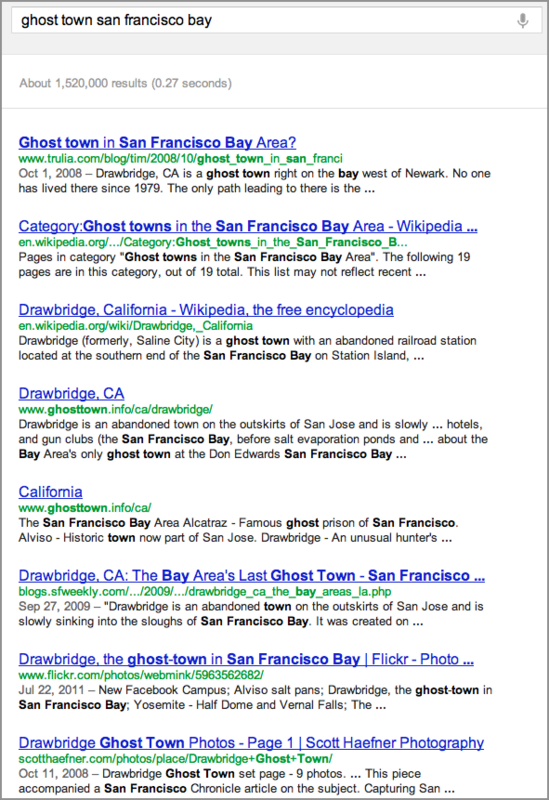 The very first result says that Drawbridge, California, is a ghost town right on the San Francisco Bay. When you pick the words to use in a query, think about how the page you want to find would talk about your idea. Using those words can give Google reliable cues to finding the information you desire. Please try the activity for this lesson, and practice selecting effective search terms. Now are you interested in learning to be a Google Power Searcher? Good! Get started here. Pretty good! I could save some time knowing this and not experience nearly as much frustration. But I got lost somewhere searching for earthquakes and then couldn’t find my way back to the answer page while all my previous pages went missing. I’ve had to give up.